Nimona is a kid but she’s a kid who can shapeshift into just about anything. She’s dangerous and volatile but she is still a child that scary things happen to. Nimona is the titular character in a web-comic that’s now a published graphic novel and it’s a great story full of fantasy and science-fiction tropes that are often turned on their head. 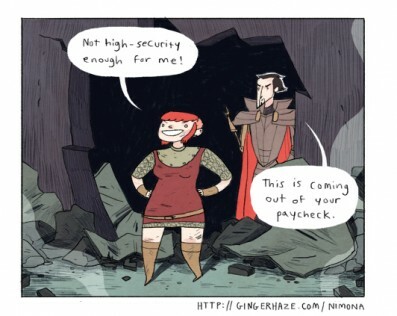 Nimona is the sidekick of supervillain Lord Ballister Blackheart but she doesn’t always do as she’s told. She’s not the best sidekick as she has her own ideas about how to do things, often her ideas include death and destruction which is a little disturbing. Nimona is an independent young woman who enjoys causing mayhem with her shapeshifter powers. She’s also very closed off about her past and doesn’t always tells Blackheart the truth and sometimes gets caught out by her tall tales. You feel for Nimona because something horrible must have happened to her in her past and she really is troubled but at the same time she has a great, sarcastic attitude to everything. A lot of time I just feel like giving Nimona a hug because she’s had such a tough life but she still finds it in herself to care about people and want to protect them, but I know if I tried to give Nimona a hug she’d probably shapeshift into some sort of vicious animal and bite me. 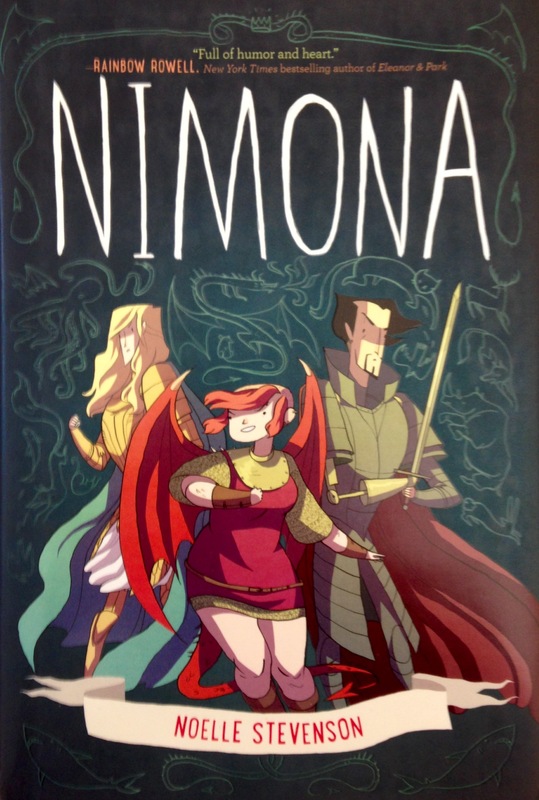 You can read my review of Nimona here. Nimona is an impulsive young shapeshifter who has decided she is now Lord Ballister Blackheart’s sidekick. Blackheart is a supervillain who wants to wreck some serious havoc and prove to the people that Sir Ambrosius Goldenloin and his bosses at the Institution of Law Enforcement and Heroics aren’t the heroes as they appear to be. But as their escapades become more dangerous and deadly, Blackheart realises that Nimona’s powers are as mysterious as her past, and her wild side might be more dangerous than he wants to admit. Nimona is one of those graphic novels that just about everyone has heard of and deservedly so. I’d read a little of Nimona when it was a web comic but even though I liked it I soon stopped reading as I don’t really like reading comics on a screen. It was great to finally get my hands on a physical copy of Nimona and I’m so glad I’ve now read the full story. I don’t think I’ve ever done a Book Haul post on here. That’s mainly because I don’t often buy books at all or I just get one or two during the month and it’s nothing special to write home about. Over the past month though I have accumulated a lot of books. So without further ado here’s what I’ve got. These books come from everywhere, Orbital Comics, my buddy Julie via the mini NinjaBookSwap, having poor impulse control in WHSmith’s and Waterstones and then having poor impulse control and taking advantage of the Booktubeathon discount at the Book Depository – go here for 100 books at a discount if you use the code BOOKTUBEATHON10 at the checkout – this offer ends soon. So what do you guys think? Have you read any of the above and what do you recommend? 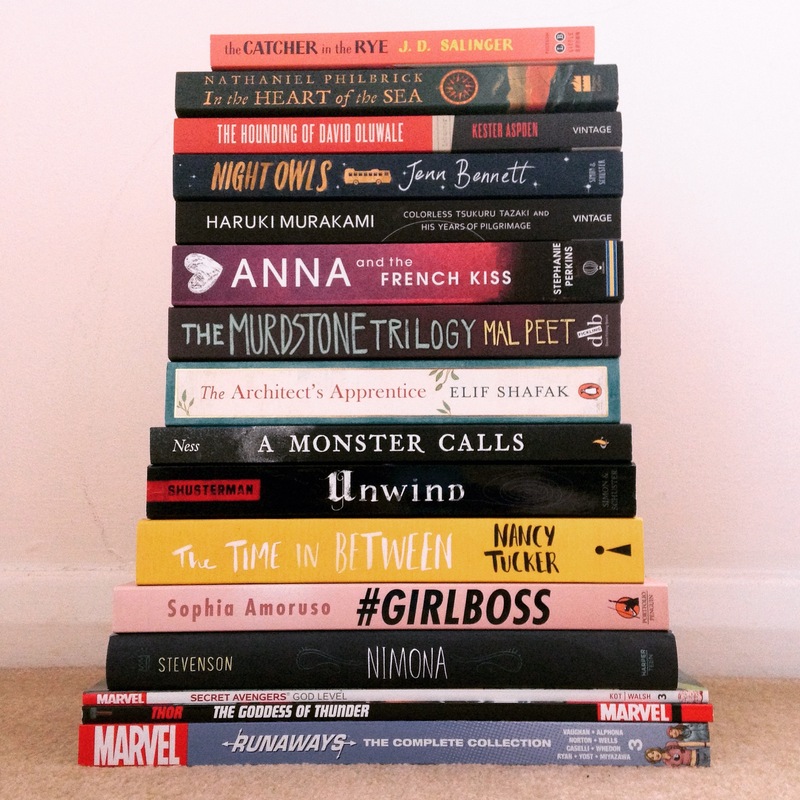 I probably shouldn’t have acquired so many books recently but oh well – we all have these moments of weakness.